A BRAND NEW two bedroomed house with allocated parking just a stones throw away from Skipton High Street. Arranged over two floors with a Brand new kitchen with integrated appliances, downstairs WC and brand new shower room on the first floor. Master Bedroom with built in wardrobes and useful study/dressing room complete the property. LIVING AREA 14′ 10" x 15′ 1" (4.54m x 4.62m) UPVC glazed door opens up into; open plan living area with UPVC double glazed mullion windows to front elevation, wall mounted electric heating, recessed LED spotlights. KITCHEN Brand new fitted kitchen with bespoke base and wall units, cream laminate worktops, fan assisted electric oven, four hob ceramic hob with chimney extractor fan above, inset stainless steel sink with chrome monobloc tap, built under fridge with freezer box, recessed LED spotlights, space for washing machine. DOWNSTAIRS WC 2′ 5" x 8′ 3" (0.75m x 2.53m) Low level WC, pedestal hand wash basin, extractor fan. LANDING With drop pendant ceiling rose & loft access hatch. MASTER BEDROOM 14′ 9" x 8′ 6" (4.50m x 2.61m) UPVC windows to front elevation, built in wardrobes, TV point, wall mounted electric heating. STUDY 7′ 10" x 6′ 3" (2.39m x 1.91m) UPVC window to rear elevation, wall mounted electric heating. SHOWER ROOM 8′ 8" x 3′ 0" (2.65m x 0.92m) UPVC opaque window to rear elevation, low level WC, pedestal hand wash basin, walk in shower cubicle with electric shower, chrome wall mounted towel heater, recessed LED spotlights, extractor fan. 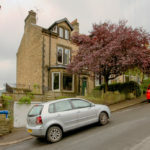 VIEWINGS Strictly by appointment through the agents Carling Jones – contact Mark Carling, Declan Bullock or Emma Carling at the Skipton Office. ESTATE AGENTS ACT 1979 DISCLOSURE In accordance with the Estate Agent’s Act 1979, Carling Jones (‘The Company’) are obliged to notify all interested parties that an employee of the Company is currently the owner of 27D Crete Cottage, Skipton.